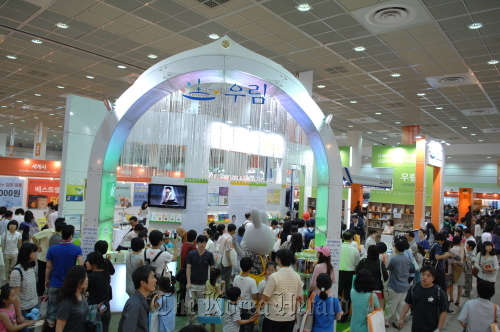 About 60 books written by Korean pastor Lee Jae-rock of Manmin Central Church, translated into 25 foreign languages, were exhibited by Urim Books at the 17th Seoul International Book Fair from June 15 to 19 at COEX in Seoul. Urim Books exhibited Lee’s books on his Christian faith and spiritual experiences along with their translated copies. Having translated Lee’s books into 25 different languages, including English, Chinese, Russian, Spanish, Japanese and Hindi, Urim Books has been contacted by publishers in the U.S., China, Indonesia, and Vietnam interested in publishing them in their own countries. The books have been also invited by organizers of Taipei International Book Fair, Abu Dhabi International Book Fair, and Bangkok International Book Fair, Urim Books said. The publisher also displayed electronic reading devices and their e-books of Lee at the fair. Actor Cho Chun, gospel singer Lee Seon-woo, and Russian professor Alexey F. Dremov of Hankuk University of Foreign Studies all visited the Urim Books booth. More than 3,000 people visited throughout the event, the publisher said. Lee Jae-rock is the senior pastor of Manmin Central Church with more than 120,000 members in Seoul. He has been named as one of the 10 most influential Christian leaders by Christian Telegraph and In Victory, both in 2009 and 2010. He was also the recipient of the 2010 President’s Volunteer Service Award in the U.S.